I know, I've had these pictures up all week without ANY text to say what's going on. Gimme a break, I'm still catching up at work. And while the hormones aren't putting me in PMS-y anxiety mode anymore, I'm still not as energetic as I'd like. And that goofy pose in the Rocket Gansey? I did have a lot better poses, but wouldn't you know the goofy one shows the best stitch definition. Get a kick out of Susanna's opinion of it... but if you ask her, she's just glad she's not in my armpit. Fiber report (pictures will have to wait...) The Poppy sweater is down to the armholes (top-down raglan wise), and stalled because now I'm obsessing on the cotton. Funny how procrastination on one project gets me going on another. I'm finally hand-ginning the cotton because that actually seems faster. Then, I'm hand-rolling some punis. The sampling I did with the punis on the SpinTech went really well, so I rolled up about 7 more. It's only taking me 10 minutes per puni... We'll see how these spin up. 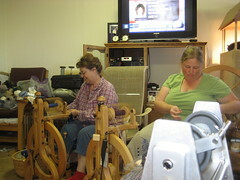 They seem to need to rest for a day before spinning. This afternoon, Cecilia came over to just sit with me. OK, we spun, and knitted, and hooted at the shenanigans on the Style channel, and I had her go out with me to harvest all the cotton bolls that have been popping in the single-digit humidity... I told her I needed somebody to fish me out of the pool if I fell in, whereupon she commandeered the clippers and harvested them for me. Geez, some people. And then I got calls from the inlaws - we're going to Omaha for Thanksgiving, and there's a gazillion things to nail down for that. That was another two hours on the phone. 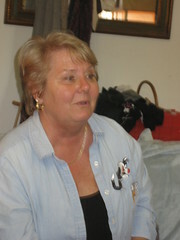 And then Deb P calls up to nag me about the blog, because, well, because. 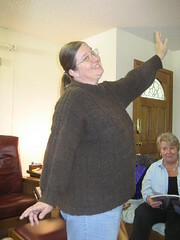 And I realized that I had posted right away on Sheep Thrills and on Ravelry, but not here. And because I'm tired (picture the hand fluttering dramatically to the brow), I'll just copy-paste it here. ... and as big a goofball as ever. I have a bit of a sore throat, probably from the breathing tube. I also have an incision above the ovary, another in the navel, and a third just above the hairline. A Frankenbelly to go with the Frankenboobs. I took out the too-outrageous I-musta-been-0n-drugs bit about my reaction to realizing they'd given me a bikini trim. Whoa. What's that all about? It must have been a contingency for more major cutting, is all I can think. This week has mainly been knitting, with a bit of spinning. And a bit of cleaning house, mainly consisting of laundry. And Cecilia has given me strict instructions not to overdo. Moi? ?